Asteroid Will Pass Between The Earth And The Moon Tuesday (Don't Panic) : The Two-Way First spotted in 2010, a space rock is zooming toward Earth, making a close pass on Tuesday that will see it fly safely by — about halfway between our planet and the moon. Asteroid 2010 WC9 was lost, then it was found — and now the small space rock that is hundreds of feet wide is zooming toward Earth, making a close but safe pass on Tuesday that will see it fly roughly halfway between our planet and the moon. The orbit of the Earth (blue line) and its near-intersection with Asteroid 2010 WC9 (in white) is seen in this diagram by the Jet Propulsion Laboratory. Before we continue: There is no risk of even a partial collision, and the asteroid will stay tens of thousands of miles away from the outer limits of Earth's atmosphere. So there's no reason to take cover when the asteroid makes its closest approach at 6:05 p.m. ET Tuesday. From the surface, the asteroid won't even be visible without the help of a telescope. And it won't be here for long: It is moving at more than 28,600 mph, according to the NASA's Jet Propulsion Laboratory. Asteroid 2010 WC9 was first discovered by the Catalina Sky Survey in Arizona back in 2010. But weeks after it was spotted, astronomers lost track of the small asteroid – and because of the short exposure time, they couldn't predict its orbital path. 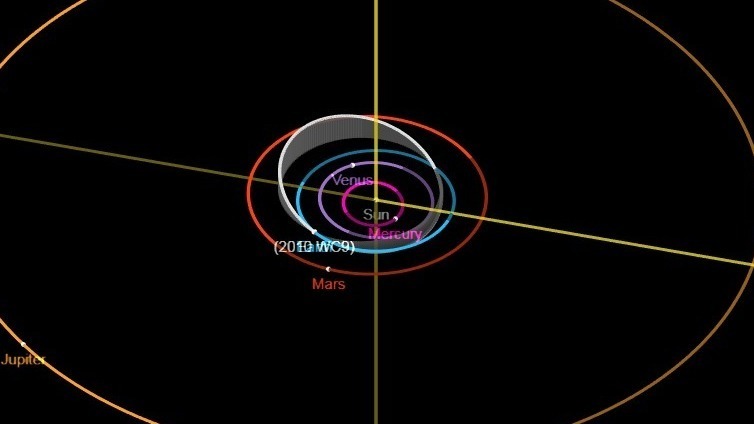 The asteroid popped back up one week ago, and scientists quickly realized that it was about to make, as EarthSky reports, "one of the closest approaches ever observed of an asteroid of this size." If you're concerned that the asteroid might be homing in on our planet, you can relax: The Jet Propulsion Laboratory's figures show that this is the closest the asteroid is coming to Earth in a nearly 300-year span. If anyone is living on the moon on May 16, 2188, they might notice the asteroid whizzing by, nearly as close as today's pass. JPL says that at its closest approach to Earth, 2010 WC9 will be just 0.00135665599569321 astronomical units away — about 126,109 miles – as it travels between the Earth and the moon. For reference, NASA says that Earth's exosphere, the upper limit of the atmosphere, extends outward to 6,200 miles. As it hurtles through space, the asteroid is also spinning. Britain's Northolt Branch Observatories, which posted a livestream of the asteroid last night, says that while it's still working out the data, 2010 WC9's full rotation took between 8 and 20 minutes. The asteroid's diameter is estimated to be from 174 to 394 feet, the Jet Propulsion Laboratory says. The asteroid is passing Earth at a much farther distance than the 2013 Chelyabinsk meteor, which, as EarthSky notes, "entered Earth's atmosphere, breaking windows in six Russian cities and causing some 1,500 people to seek medical attention."